The CounterForce PDC bit utilizes a staggered cutter configuration inspired by the machining industry to improve mechanical specific energy. The cutting structure features pairs of cutters with opposing side rakes (angles), which allows the bit to harness reactive forces from the formation to counter lateral forces from the drillstring. Excessive vibration caused by unrestrained lateral forces in directional wells can wreak havoc on drilling operations. In addition to reducing ROP, directional control (i.e., steerability) and overall drilling efficiency, torsional vibration at the bottomhole assembly (BHA) is often pegged as the source of a number of costly issues, including broken cutters, dull bits, trips and even damaged formations. To address such vibration-related problems, Ulterra Drilling Technologies has developed CounterForce, a patent-pending technology with a cutter orientation design inspired by the machining industry. 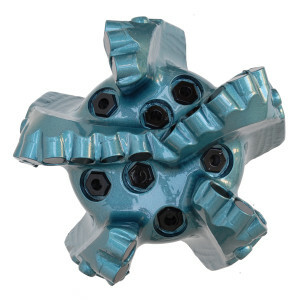 It features a staggered cutter configuration capable of improving mechanical specific energy by dampening vibration, reducing bit reactive torque and redirecting force back into the rock. The cutting structure features pairs of cutters with opposing side rakes (angles), which allows the bit to harness reactive forces from the formation to counter the lateral forces from the drillstring. In the event that forces from the BHA are strong enough to initiate lateral bit movement, the cutters fail the rock in front of them. Instead of wasting the energy from vibration – which can be seen with conventional PDC bits – CounterForce uses it to break the formation and drill ahead. The cutters are also designed to work together and engage the formation. Individual cutter fracture mechanisms are directed into each other, which optimizes crack propagation by requiring less energy to remove rock. Canted cutters are also able to remove dislodged cuttings more efficiently, forcing the drilled solids directly into the hydraulic flow path to enhance evacuation. This ultimately results in a more efficient cutting mechanism. Since CounterForce was launched in April 2013, the technology has drilled more than 4.5 million m (15 million ft). 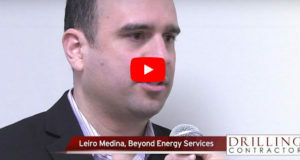 Applications have grown from locations across the US and Canada to regions such as Latin America, Australia, the Middle East and North Africa, and the Asia Pacific. 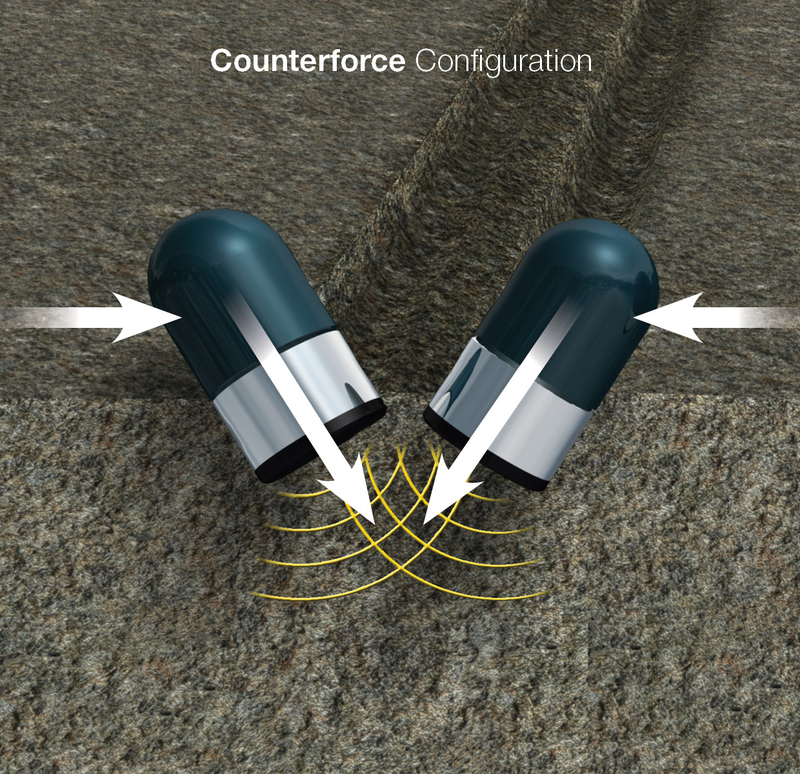 The CounterForce bit was designed to counter vibration-related problems commonly found in directional wells. It takes the energy from vibration, which is wasted with conventional PDC bits, and uses it to break the formation and drill ahead. Since its launch in April 2013, CounterForce bits have drilled more than 15 million ft around the world. In Oman, an operator using a roller-cone bit with a mechanical rig was experiencing issues caused by excessive lateral vibration during the drilling of a 12 ¼-in. surface hole. Because the rig lacked the horsepower and capabilities present in many of today’s advanced AC hydraulic rigs, the drilling assembly was not adequately controlled. Conventional PDC bits had been experimented with on the well at different times. However, with the amount of torque being generated, it was simply too much for the mechanical rotary table to handle. In a final effort to utilize a PDC bit, the operator selected an Ulterra U516S (steel bodied, five blade, 16-mm cutters) with CounterForce technology. On its initial run, ROP was measured at 57 m/hr – a 90% increase over the average ROP of the roller cone bit, which was 30 m/hr over a 600-m section. On the second run, ROP measured 62 m/hr before settling down to an average of 57 m/hr through the remainder of drilling. In this case, CounterForce was able to overcome the inherent limitations of the rig and allow a PDC bit to be used where roller cones were the only option previously. A similar situation was seen with a major Middle Eastern operator drilling a 12 ¼-in. directional well offshore. Penetration rates on close offsets drilled by the operator were in the range of 12-15 m/hr. On the first run using CounterForce, ROP increased by as much as 100%, measuring 25 m/hr over a 600-m interval. 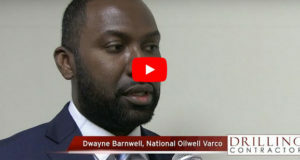 This ultimately resulted in a 9-hr reduction in drill time, translating into cost savings between $75,000-$80,000 given the rig’s spread rate. In addition, the operator decided to systematically replace all existing PDC bits with ones featuring CounterForce. In the Eagle Ford, this technology has also shown results. In one instance, a major operator using a rotary steerable system (RSS) was experiencing difficulty drilling a vertical, curved and lateral section in a single run. During the run, ROP was measured at 45 m/hr, but excessive vibration in the form of high amplitude stick-slip was a limiting factor, occurring approximately 24% of the time. On an offset being drilled by the same operator with a similar well plan 2.5 km away, a bit (U516M) with CounterForce was being used. Stick-slip occurred only 3% of the time, and instantaneous ROP was measured at 64 m/hr. As a result, the operator elected to use CounterForce bits on every subsequent well that the rig went on to drill. One of the most important reasons why the directional driller normally prefare the Tricone over the PDC is the tool face stability. This tool face issue either result from stick – slip or whirl vibration mechanisms. As per your article the Counterforce technology overcomed this point. What about the instability related to Whirle vibration.